This happened within the last couple of days or so. 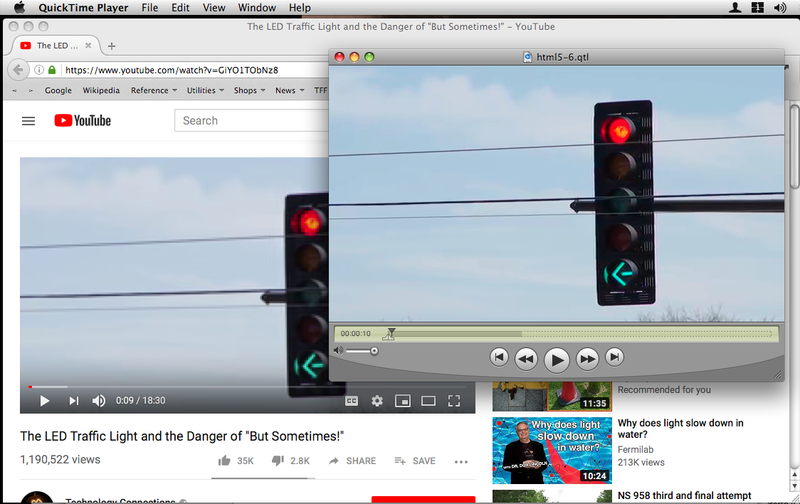 When attempting to play a YouTube video with a known QuickTime version extant, after right-clicking the title line, and clicking the box that comes up, Quick Time Enabler reports "not a QuickTime Video." YouTub(ers) appear to have changed their script formatting, breaking Quick Time Enabler. Can this be "fixed?" If so, any timeline for when the new "fixed" version of QTE will be released? Thanks in advance. I was able to reproduce this (kind of) problem on one video, others work fine. Since I actually received a different error message than you did (mine said 'not a movie file'), can you post a few YT vidos affected by your problem so we can have a look at what they have in common? Your error message is actually what I got, sorry about the inaccuracy. I'm not able to get screenshots to paste here. Below are links to three YouTube videos. Can you post a link or two that work for you? The videos you linked to all work for me (see screenshot). Quicktime 7.6.4, QTE 120, TFF FPR 12 for Dual G5, OSX 10.5.8. Note the path that I received from QTE. Let's try the file again. OK, so my setup is: 10.5.8, QTE 120 (I use SD), TFF FPR 13, QuickTime 7.7, but QuickTime Player 7.5.5*, Perian 1.2.3, several legacy codec plugins such as Xvid, DivX, WMV, MPEG2 etc. I think Perian is most likely what makes the difference. *all later versions have a QT Pro export crash bug in the player that Apple never fixed for PPC. Did you get the zipped up screen shot, or did Tender strip it? Prior to a couple of days before my first topic, Quicktime Enabler worked. With zero changes on my end, it stopped. Thanks. The issue actually ended up being "cache poisoning." I flushed the cache in case "something" was left behind giving QTE indigestion. With an "empty" cache, I navigated to YouTube, and QTE worked once more. I don't like to flush my cache on this box because one of the sites I frequently visit uses a "security cookie," and it's a minor pain to regenerate the cookie. Thanks. The was no .zip file; you can attach screen shots directly as PNG or JPG as I did. Good to see your issue is resolved, though. You can clear cookies and the cache independently, go to History > Clear Recent History to choose what to delete.